"I come as one, I stand as ten thousand." Have you ever wondered about the women who stood before you? The women who walked the same streets: 50, 75, 100, 200 years ago? What they saw and did everyday? What they had to endure? Where they had their biggest triumphs? Their biggest failures? The history of women of color is all around us, for it is the history of America: it is in the ground we walk upon, the rooms we enter, in the buildings we pass. But often our histories seem inaccessible, invisible, buried. 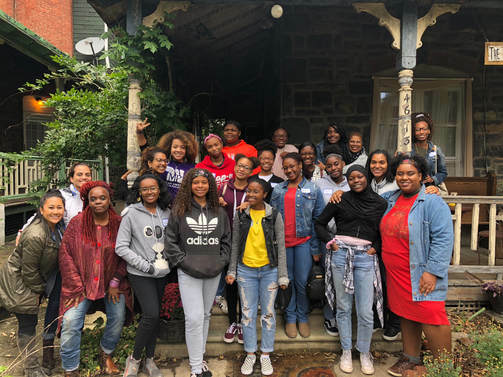 Philadelphia Young Playwrights has partnered with Germantown’s renowned Colored Girls Museum to explore these very questions. To unearth the hidden, historical narratives around the lives and experiences of women of color in Germantown. Over the course of the 2018-2019 school year, we will investigate how history and identity can be “hidden,” and how we can work to “recover” it through our research, our words, our bodies, and our art. We will be conducting interviews with local residents, and working with librarians, museum professionals, teaching artists, and historians to look for evidence of who and where black women were in 19th and 20th-century Germantown. In the spring we will turn our attention towards art making. We will gather to share what we’ve learned through a mixture of monologues/character studies/notes toward potential “one girl shows”/installations and other art forms based on the ordinary extraordinary women we have researched. The Colored Girls Museum is a memoir museum, which honors the stories, experiences, and history of Colored Girls. This museum initiates the ordinary” object—submitted by the colored girl herself, as representative of an aspect of her story and personal history, which she finds meaningful; her object embodies her experience and expression of being a Colored Girl. The Colored Girls Museum is headquartered in the historic neighborhood of Germantown in Philadelphia.